The vice president and minister of Women’s Affairs, Her Excellency Aja Dr. Isatou Njie-Saidy yesterday receives in audience the outgoing Egyptian ambassador to The Gambia in Senegal. His Excellency Hecham Maher, who met the VP at State House as he bade farewell to the leadership of the country, described his diplomatic mission in the Senegambia region as fundamental to the broadening of relations with The Gambia. He said he came to make farewell audience with the country’s leadership after completing his international duties, and to equally convey the message of his president, Abdel Fattah Saeed Hussein Khalil el-Sisi, to The Gambian leader His Excellency Sheikh Professor Alhaji Dr. Yahya Jammeh Babili Mansa. In an interview with reporters after a closed door audience with the vice president, Ambassador Maher said one of the reasons of making this farewell audience was to reaffirm once more that his country is always willing to strengthen its brotherly relations with The Gambia. “We are trying to expand the field of cooperation to include new fields and enhance our economic cooperation and to invite investors from Egypt to come and invest in The Gambia,” he informed. He described The Gambia-Egypt relations as perfect and specific and that it has gotten better within the four years of his duty. During his time as ambassador, he further indicated, the relationship has improved significantly with new cooperation in areas such as agriculture, public administration, security and communication. On tourism, the outgoing ambassador said The Gambia is also doing very fine in that area, noting that it’s a field that the two countries can cooperate. He described the area as a very important sector, acknowledging that Egypt is significantly benefiting from tourism. “We consider tourism as very important not only to the economy, but also in giving people the opportunity to know each other through cultures and traditions,” he said. On the international scene, His Excellency Maher said the two countries are harmonising their positions with diverse issues but with the same position. He said that the countries do support the candidature of each other at the international platform and are building very good coordination at the international forum as well. 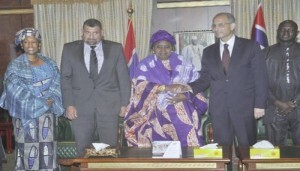 He therefore paid tribute to The Gambia for its support to Egypt in that regard. The outgoing ambassador told reporters that he had fond memories in the country, saying whenever he came to The Gambia, he met a lot of people who he said are very kind and very receptive. He pointed out that Gambians feel very close to Egyptian people because of the longstanding relations the countries shared, and he added made him feel at home always.